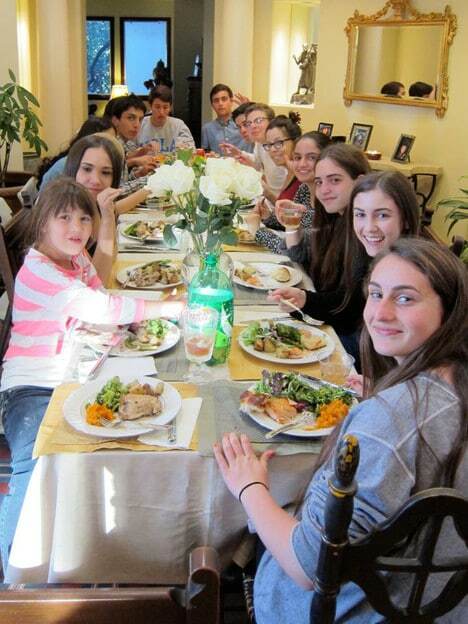 A few weeks ago, my stepdaughter brought her Jewish Studies class to our home for a Shabbat dinner celebration. The gathering was organized by her teacher, Cheryl Cohen. My stepdaughter always talks about Cheryl with a smile on her face; she loves her Jewish Studies class and everything she learns there. 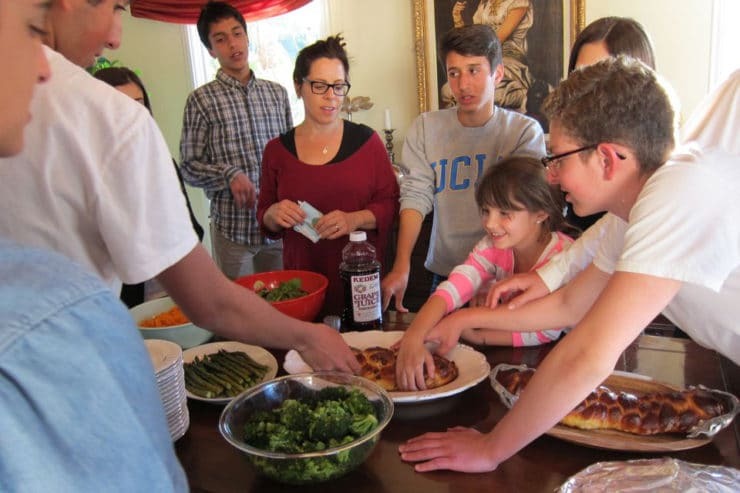 It was Cheryl’s idea to organize a Shabbat meal with the students, where they do all the cooking and preparations themselves (with a little help from us, of course). After our dinner together it is clear that Cheryl is making a positive, lasting impact on the lives of her students. 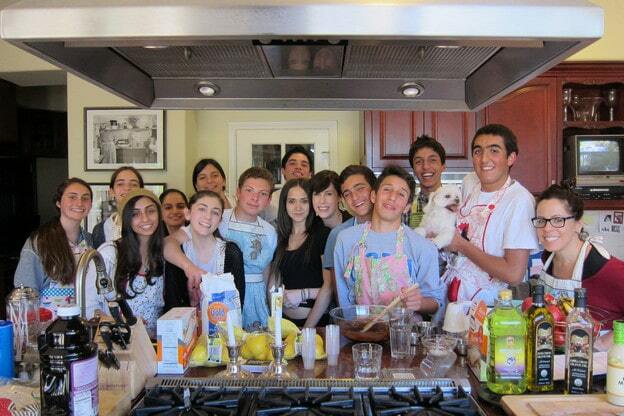 They were so excited to experience Shabbat together as a class, and I was excited to have them all in my kitchen! The kids decided to make Cheryl’s recipe for Rosemary Roasted Chicken and Potatoes with olive oil and garlic as the main entree. In addition to that, I taught them how to sear salmon and how to make chocolate toffee matzo crunch. They made mashed sweet potatoes, asparagus, broccoli, salad, fresh fruit, and of course freshly baked challah that the kids braided themselves. When everything was ready, Cheryl led the Shabbat blessings as the sun set. As part of the blessings, each student talked about what they’re grateful for and what they hope for in the coming week. The candles were lit, then it was time to eat! We set up a long table in our entryway so there was plenty of room for everybody to enjoy the delicious meal they created. 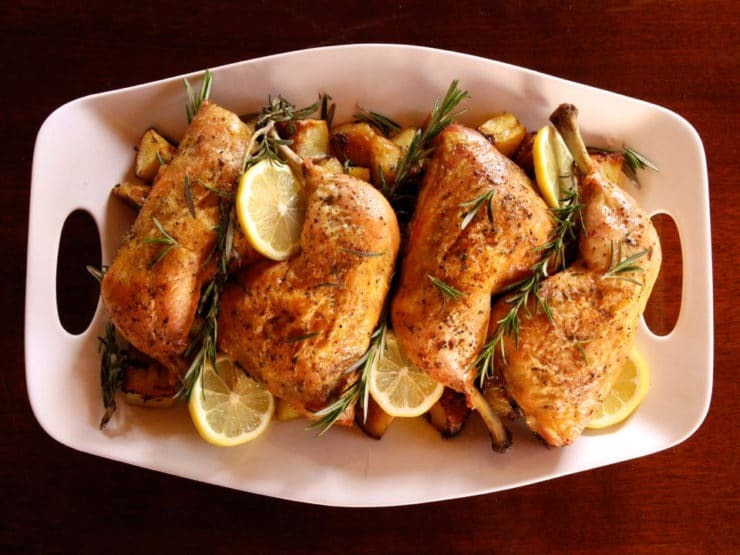 This Rosemary Roasted Chicken and Potatoes recipe is inspired by our Shabbat dinner. Skin-on chicken pieces are brush with olive oil and seasoned, then roasted in a hot oven on a bed of potatoes, garlic, rosemary and lemon. The whole garlic cloves and fresh rosemary infuse the chicken with tons of flavor. The potatoes roast up tender with crispy brown exteriors, infused with flavor from the juices of the chicken. This is a one-pan meal, meaning there is no need to dirty a bunch of dishes– toss the potatoes in a bowl, but otherwise all you need is a roasting pan. It’s a delicious way to cook chicken… easy enough for a weeknight meal, yet special enough for Shabbat or any occasion. Enjoy! Easy, healthy, one-pan meal. 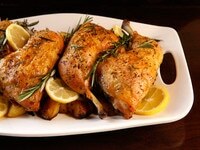 Seasoned chicken pieces roasted on a bed of potatoes, garlic, lemon and fresh rosemary. Simple, elegant entree. Preheat the oven to 400 degrees F and place your empty roasting pan inside to heat along with the oven. 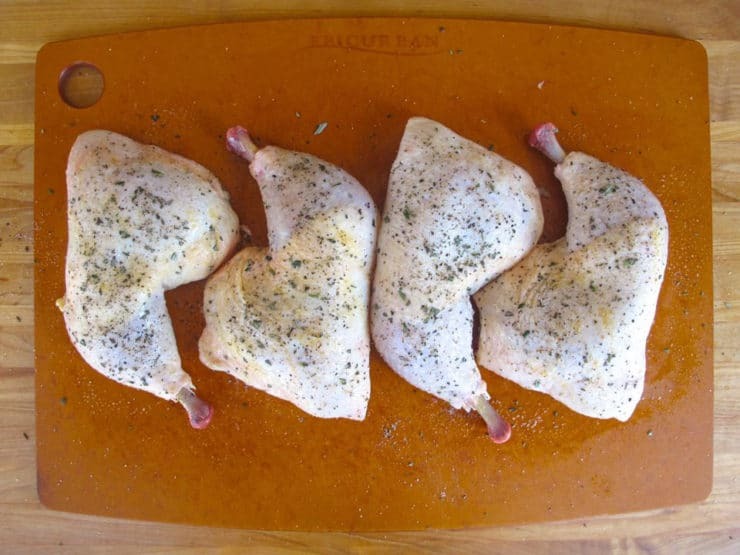 With the chicken skin side up, brush pieces with olive oil, then generously coat with 2/3 of the salt, pepper & rosemary. Flip over and brush with oil again, then sprinkle with remaining salt, pepper and rosemary. 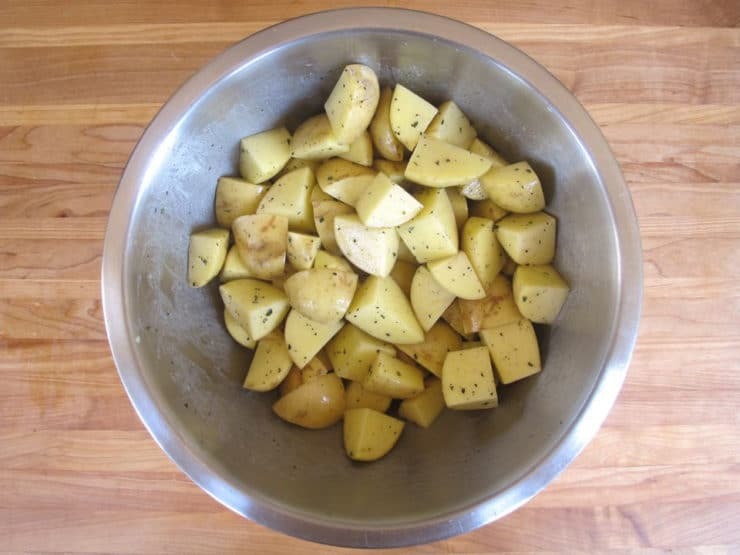 Cut the potatoes into 1 inch chunks and place in a large mixing bowl. Toss them with the olive oil, garlic cloves, salt, pepper and 1/2 tsp minced rosemary. While wearing oven mitts, very carefully remove your hot roasting pan from the oven. Spray the hot pan with nonstick cooking oil spray. Quickly and carefully pour the potatoes and garlic evenly across the bottom of the pan. 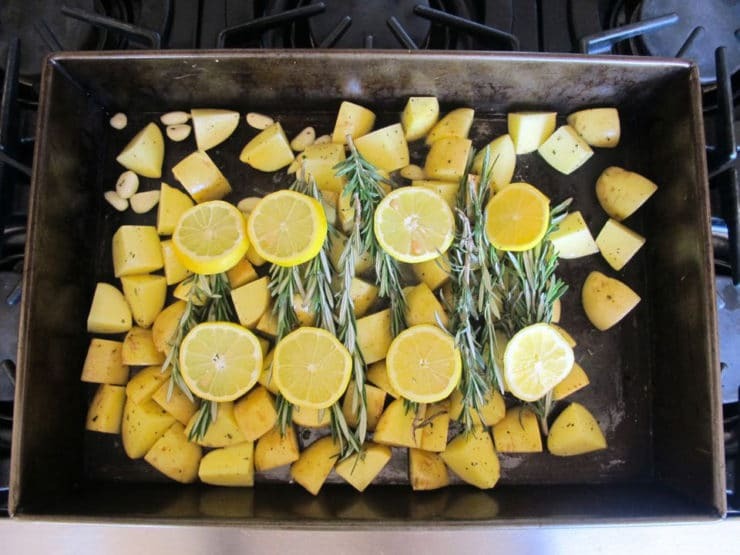 Place the large fresh rosemary sprigs and lemon slices on top of the potatoes. The idea is to create a bed to lay the chicken pieces on. 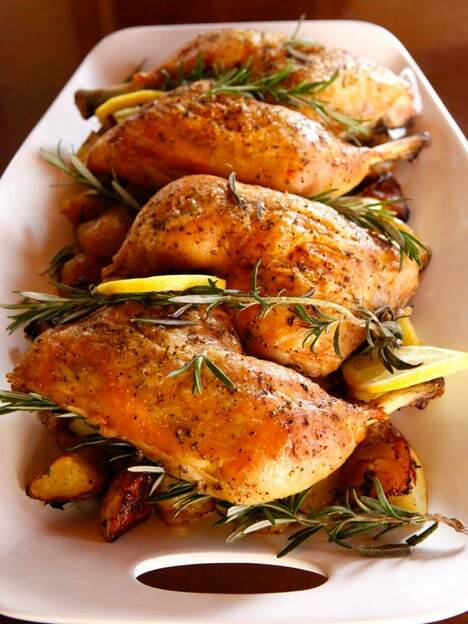 Lay the chicken pieces on top of the potatoes, rosemary and lemon. Return the pan to the oven and roast for 30 minutes. After 30 minutes, remove the pan from the oven and give the potatoes a good stir to be sure they are well coated with the oil and fat from the chicken. You may need to remove the chicken for a moment to do this, just be sure to replace it when you are finished stirring the potatoes. Once the potatoes have been stirred, increase the oven heat to 450 degrees and return the pan to the oven. Roast for an additional 45 minutes or until the chicken reaches an internal temperature of 170 degrees F, the skin is crisp and potatoes are browned and tender inside. 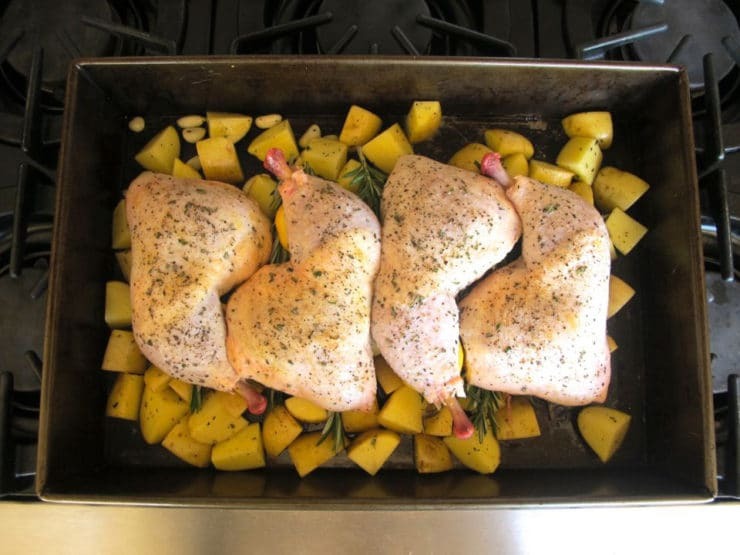 The potatoes and chicken should be done around the same time; if the potatoes do not feel "done enough" you can remove the chicken once it's fully cooked and continue to roast the potatoes till they are cooked through. NOTE: If you find that the potatoes are sticking to the bottom of your roasting pan a bit, gently slide a metal spatula beneath them and they should move fairly easily. 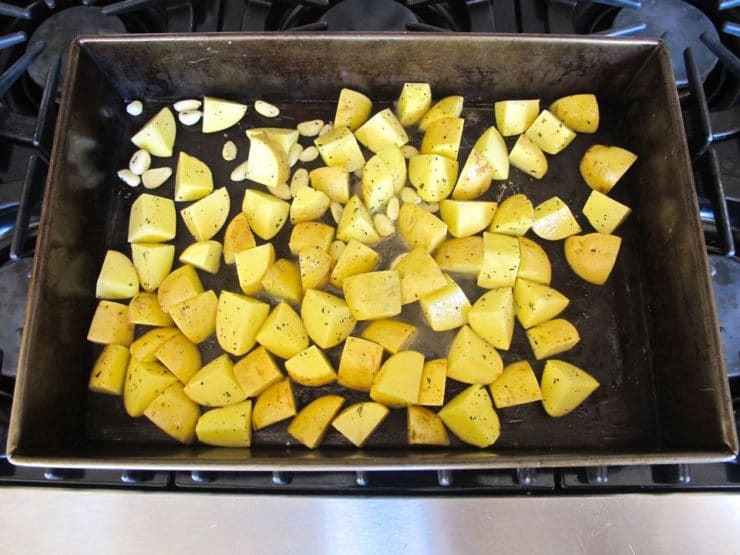 If you use a smaller roasting pan than 12x17, you may find that you have too much oil/fat in the pan towards the end of cooking, which will prevent the potatoes from getting crisp. If this happens, remove the chicken when it is fully cooked, drain off most of the excess fat and oil, then crisp up the potatoes under the broiler at the end of cooking. For a pretty presentation, serve the chicken and potatoes on a serving platter and garnish with fresh rosemary and lemon wheels. Did redskin potatoes, and added half of a red onion, large slices. Talk about flavor! The potatoes had a nice vinegary tartness. The chicken was a little dry, so I would check it 15 minutes sooner. Definitely a keeper! Thanks, Tori! browning the veggies under the broiler. Awesome!! This dish looks amazing. I am planning to make this dish for my parents and their pastor when I go to visit as part of a dinner. What would be a good salad to start this dish with? This looks great! I’ll be making it this evening. I have tried without success in the past to find Yukon Gold potatoes here in southern California. I’ve searched for them at Ralphs, Stater Bros., Alberstons, and no one has them. Could I use small red potatoes, or even russet potatoes instead? I love your recipes. Keep up the great work! Hi Fred! Yes, red potatoes would be a good substitute. You can also use baby or fingerling potatoes, the very small ones can be kept whole. You can use russets in a pinch, however they have a tendency to overcook and stick to the pan, so I prefer less starchy potatoes like gold or red “new” potatoes. I have this in the oven right now— and it smells delish. I did increase the food amount due to needing to feed a few unexpectedly due to a passing in a friends family…. but the cooking time hopefully won’t need to be adjusted too much. I did use four bone in chicken breasts as that is what I had in the freezer– quick and easy to thaw out when you need something quick. I’d love to try this recipe for our Passover seder this weekend. If I make it ahead in the afternoon, is there a way to re-heat it and still keep the crispy skin and potatoes? Thanks for all your wonderful recipes! I did not say that fat was bad. I mentioned that animal fat is not healthy. I did not mention processed food excess sugar, salt or anything else. I enjoy your recipes very much, and thank you for them. I do however find ways of eliminating animal fats and substitute olive oil, or any healthy oil instead. There are very simple ways of doing so, and this is the Mediterranean diet that I and my whole family (on their own volition) prefer. 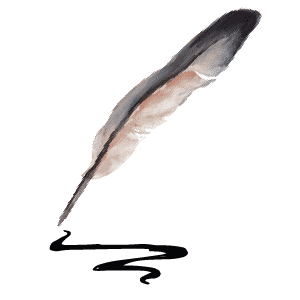 Thank you again for your wonderful, enjoyable and lively blog. Hi Edna, thank you for sharing your thoughts. I also stick with a largely Mediterranean diet and feel it is healthiest for our bodies. As you probably know from reading my blog, the majority of my recipes fall in line with the Mediterranean way of eating. It is precisely because I eat this way the majority of the time that I feel fine with indulging in a little chicken fat from time to time (as I said before, everything in moderation). I brought up processed food and sugar because I feel that these are far more detrimental to our health than natural fats, be they animal or plant based. That said, I’m sure folks who are cutting down on their consumption of animal fats will appreciate your input and ideas. I’m so pleased you’re enjoying the blog and the recipes. This is a very tasty recipe, and the potatoes are yummy roasted this way. However, the chix pieces with the skin on, which is the way to go,release quite a bit of chicken fat. This is a health no no for a majority of people, as the potatoes will cook in this tasty but taboo animal fat. Hi Edna, I’m glad you like the flavor of the recipe, but I have to disagree with your assertion that chicken fat is a “health no no for a majority of people.” More and more in recent years, physicians and nutritionists are backing off the “fat is bad” rule as we learn that processed foods, sugar and empty carbs are a bigger contributor to cholesterol and heart disease. I am not a nutritionist, but I do feel that fat has been given a bad wrap. Nobody should be eating copious amounts of chicken fat every day– everything in moderation. That said, this is not a low fat blog. I find this particular recipe very nourishing and would not hesitate to feed it to my family, chicken fat and all. Just a couple comments…I made this at my moms house in a rather small roasting pan with 5 large leg quarters. Because of the size of the pan and the amount of juice given off the potatoes were about 2/3 covered in juice/oil. While they were done they were not crispy. I had to pull off the chicken and put them under the broiler to crisp them up a bit. I’d suggest using the largest roasting pan you can find and not increasing the quantities in the recipe as the results may not be the same. The food was great but didn’t look anything like the wonderful pictures above! Great notes Charles! I did indicate a large roasting pan, but now I’m thinking I should write the actual dimensions to be clearer. 🙂 Thanks for the feedback! Hi Gill– the chicken part of the dish should freeze well, but I would not freeze the potatoes. Your Rosemary Roasted Chicken looks like a “winner” — on my menu for the coming week. Loved the pictures of those happy young “kids” enjoying Shabbat Dinner – Best Wishes on the combined website – am sure it will be as informative and delicious as always. Your recipes are the BEST. It just came out of the oven. I took it out after only 25 minutes at 450 because it looked like the chicken was starting to dry out. The house smells wonderful. Enjoy Toby! Every oven is a bit different, as long as the internal temperature is 170 degrees F you’re good to go. 🙂 It does make the house smell heavenly. can i use sweet potato? will it change the cooking time? Hi Ella, the trouble with using sweet potato is that the chunks will produce a sugary syrup as they cook, which will likely cause them to stick to the bottom of the pan. Though I do love sweet potatoes, I wouldn’t recommend them in this particular preparation. If you decide to try it anyway, please let us know how it works for you. yum, it is good, mouth watering. I think if u were in the US we’d be having a cook off all the time, this is one of my fav flavor combos, tho I might add garlic. Looks wonderful! Shabbat dinner this week…. We don’t eat potatoes, so will this do just as well with the chicken alone? Or do the potatoes add something necessary to the taste. Naomi, you can roast the chicken alone, but make sure to put a generous layer of oil on the bottom of the pan (or line the pan with parchment) to make sure it doesn’t stick. You could also replace the potatoes with other veggies, like carrot and celery slices. What a great post – thank you for sharing the experience and photos – I was really moved. And the recipe – oh my goodness – all of my favorite things in one dish. This will be my next Shabbat dinner for sure. Thank you for another great recipe. Both my son (23 and a great cook) and I love them. A wonderful recipe, but mostly, thank you for sharing the group Shabbat dinner – just made me smile! P.S. I made your Chicken Shawarma today – major YUM! This one goes on my list as well – I LOVE rosemary and chicken! A good recipe without the American Fixation on sugar. I’m always worried about recipes that suggest putting potatoes (or any other vegetable) in with raw chicken to cook. My concern is that the juices from the raw chicken – which may contain Salmonella – will absorb into the potatoes and potentially make guest sick. Is this a real concern or am I just neurotic in the kitchen! Garlic rosemary chicken….Shabbos dinner favorite. We do one all most like this. Going to try this with a whole chicken, have one in the freezer I want to use up. Yum Tori! Can you make this with just the wings I cant eat dark meat of any bird, it makes me sick! Id like to make this w wings instead of buffalo wings . Yes you can Kimberley, or you can make it with breasts if you prefer. Any chicken pieces will work. If you’re using wings they will probably cook in an hour or less, so you may need to remove the wings once they’re cooked and finish cooking the potatoes separately (they may take longer). Enjoy! With small size chicken pieces, you can par-boil the potatoes first, then add them for the remainder of the cooking time. The parboil time depends on the size you cut the potatoes. If they are relatively small, remove them from the water in about 5 minutes. If they aren’t too soft, they will still crisp up during the roasting. Thanks so much Tori you really care about helping us thankyou! This sounds amazing. I will be trying this for an upcoming Shabbos dinner.